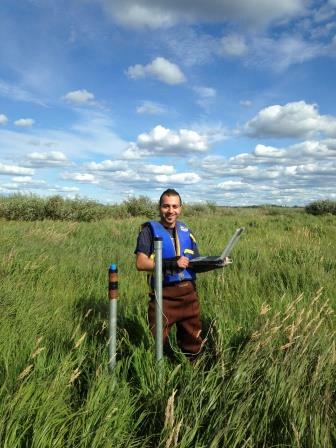 Sina is a PhD candidate and researcher at the University of Northern British Columbia (UNBC). Sina completed his master's degree in water resources at the University of Algarve, Portugal, and received his bachelor's degree in Agricultural Engineering (Branch of Irrigation) from Iran University. He has been involved with numerous municipality projects as an Advising Green Space Engineer designing green space for public recreation areas and gardens. Sina moved to Canada in 2012 and has been involved with various researches and has held several positions. Sina joined an environmental consulting company as an environmental scientist for one year. He has had the opportunity to work on numerous environmental site assessments, primarily at upstream and downstream petroleum facilities, but also on several residential, commercial, and industrial lands. In 2013, Sina joined the Northern Hydrometeorology group (NHG) where he has been involved with several watershed management projects. Furthermore, Sina's widespread academic and research background as well as his extensive field experience, have provided him with a solid understanding of behaviour-based safety awareness, program implementation, and insight into quality data collection. Sina has been involved in many high quality professions that emphasized strict confidentiality and professionalism such as the Director of Students Affairs and the PhD representative in the Graduate society at UNBC. His research interests involve studying hydrology, watershed management and surface and ground water modelling. He has had several full teaching assistant and lab instructor positions at UNBC. Sina is not only active in academics, as he is also the karate instructor at the Northern Sport Centre. Northeastern British Columbia (BC) is undergoing rapid development for oil and gas extraction, largely depending on subsurface hydraulic fracturing (fracking), which relies on available freshwater. Even though this industrial activity has made substantial contributions to regional and provincial economies, it is important to ensure that sufficient and sustainable water supplies are available for all those dependent on the resource, including ecological systems. Further, BC statistics predict that the northeast region’s population will increase by 30% over the next 25 years, thereby increasing the demands of domestic and industry water usage. Hence, it is essential to generate baseline information by assessing the sustainability of current and future plans for freshwater extraction in northeastern BC. In more detail, this research is intended to provide the historical and regional hydrological processes at two boreal watersheds—the Coles Lake (CL) and Tsea Lake (TL) watersheds—in northeastern BC. Hydrological components within the northeastern watershed are quantified through a combination of fieldwork, observational data, analysis and numerical modelling. In addition, all components of the CL water budget (hydrological year 2013–2014) are measured, for purpose of water licensing and approval by regulators and decision makers of Quicksilver Resources Canada Inc. (Quicksilver).